Aurora, “Whiteness,” and the Double-Standard of Deviance/Social ControlThe moment I learned the identity of the shooter behind the Aurora massacre (read white male), I knew how the story would go. James Holmes would immediately be subjected to amateur psychiatric diagnoses--he would be "sick," "insane," "sociopathic.” I imagined headlines just like this--"What Does a Killer Think? Is the Colorado shooter delusional, depressed, or psychotic? And how do we stop the next one?" His story would be his lonesome own, no matter that he precisely shared the demographic characteristics of the vast majority of the 56 other mass murderers/spree killers who have shot up schools and malls and workplaces over the past 30 years. But the true power of this story becomes clear in juxtaposition of competing systems of social control--the Medicalization of White versus the Criminalization of Black/Brown. A conversation with a colleague (one with whom I have had frequent chats with about the construction of the school to prison pipeline) brought the point home. "You know, I never fully understood what you were talking about until I saw the coverage of Aurora and then thought about what they did to Trayvon," she said." Five minutes after we knew the Colorado shooters identity, he was described as mentally ill and..."
"And Trayvon was criminalized even though he was the victim, even though he was the one who was actually dead??" I interjected. "Yes" she replied sadly. "There it was." Certainly one of the prime benefits of white privilege is the right to represent yourself and to do so without fear that your actions will be used to condemn all who look like you. Or vice versa. But the power of white privilege extends beyond individual versus collective accountability and representation. The white racial frame also shapes the labels we attach to aberrant white behavior and the systems we call upon to control the related deviance. Although James Holmes is indeed facing criminal charges of the most extreme sort, it is the medical model that is called on to "understand" him. He isn't totally "bad"--despite his horrific criminal acts, Holmes is a mutant, an aberration on the trajectory of "normal" white maleness. Even in the context of criminal justice--insanity pleas or no, death penalty or no--he will be viewed as "psychopathic,” ultimately then as "sick.” Someone should have/could have "helped" him before it was too late. Of course, one of the key features of the medical model involves mitigating deviant behavior by attributing it to "sickness rather than badness,” with a particular focus on the condition rather than the behavior and treatment as opposed to punishment. The white racial frame increasingly sees white "deviants" as sick--and maybe some are--but contrast this with the framing of both offenders and victims of color. They are irredeemably "evil"--no questions asked, guilt assumed, and punishment--in draconian legal systems not posh private treatment centers--is the corresponding response. The collective taint of criminalization is so strong that the actually innocent may be easily swept up, wild racial hoaxes furthered without sufficient doubt, and victims, such as Trayvon Martin, reframed via "white logic" as dangerous hoodie-wearing thugs who ultimately got just what they deserved.Comment: This dichotomy sums up white/Indian history as well as white/black crime. Indians were heathen and savage; white men were God-loving and civilized. 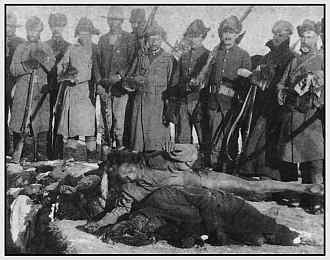 White men engaged in battles; Indians committed massacres. White men innocently defended their homes; Indians ruthlessly attacked for no reason. Actually, whites rarely if ever admitted committing crimes, so they wouldn't even cop to being sick. But Indians certainly were considering deviant--as in inhuman, bestial, even demonic. If you wanted to illustrate the concept of deviance from the civilized "norm," you'd probably use an Indian. For more on the recent shootings, see Sikh Shootings Reflect White Supremacy and Aurora Shooting Shows America's Pathology. Below: Indians punished for being "deviant." Racism is a mental affliction in its own right. And it generally affects whites, particulary white males. With racism breeds all kinds of filth such as hate, fear, depression, tendency for violence and so on. The notion of white males who are racists by catagorizing them as "mentally-ill" makes perfect sense. But in general--racists are criminals. No doubt some of the worst in society. Which is why neo-Nazis, white supremacists and other "extremists" sorts are feared by the law enforcement community and Federal agencies alike. You can thank white supremacist Timothy McVeigh for paving the way for the new meaning of "Domestic Terrorists", long before scumbags like James Holms. "Racism is a mental affliction in its own right. And it generally affects whites, particulary white males." No less and no more than females, and males of any color. I've never noticed any difference. Other than whites, leaning toward males, have tended to be richer and more powerful, so they can do a lot more damage with their racism than others, Generally. The capacity and willingless of anyone of any 'color' to be racist is quite apparent. We've even seen it in commenters in this blog, from whites, and also from Natives (including one who famously and repeatedly said he opposed Obama's election because he was black). Also, again, check out a typical Cleveland Indians game. No, you won't notice that Black or Latino fans sport the "Chief Wahoo" logo any less than the white fans do. Racism is a human condition, not limited to any "race".